Merry Christmas from my family to YOURS!!! May today and everyday be the best day of your life!!! This entry was posted in Family Photography on December 25, 2018 by Krystal Thornton Photography. You are looking for a Wedding Photographer, but they’re everywhere. Everyone is claiming to be a professional. But how do you really know? You check reviews, but sometimes that’s not enough. How are you supposed to decide on such an important decision? You need to ask yourself some questions first about what is most important to you? What is your end goal? When your wedding day is over how do you envision it went. Think about it. I am going to give you some serious things to think about! You start with your brides and bridesmaids getting your hair and makeup done photograph the bride and her girls, along with any family members in the room with the bride. Details are captured, but hair and makeup ran late and now you have to rush missing a ton of shots. You get to the ceremony and it starts late because important members of the wedding party are not there. The photographer decides to take a creative shot and completely misses the first kiss. The ceremony is over and you are rushed off the ceremony property without getting all of the family/wedding party photographs you wanted. You get to the reception, and the majority of the wedding party is drunk so no one is listening and going in every direction. You do the required reception activities, dancing, cake cutting, and eating. You look at the clock and the 5 hours you hired your photographer is over and they are leaving. NOW, if you hired a PROFESSIONAL this is what you didn’t realize. A professional knows that hair and makeup run late about 99% of the time and would have shown up early to photograph the details, dress and little things that go on the bride. Because a professional knows that once the items are on the bride they DO NOT come back off. You can’t go back and re-shoot the dress once it’s on. A professional would have a PLAN B for every situation. A professional would only take a creative shot if they have something in place so they don’t miss the first kiss. Or a plan B on what to do if it is missed. A professional can plug out family photographs super fast, and can be aware of the situation before it happens. If they notice that the wedding party is getting a little tipsy, they would have gone and grabbed someone from the reception to help get everyone in line or another family member to make sure everyone is safe and capable of functioning. One last thing is a professional comes to you first before they leave. They take their time because they know that sometimes the best shots are after hours. Your wedding day is one of the most important days of your life. When deciding who to trust. Trust a professional! 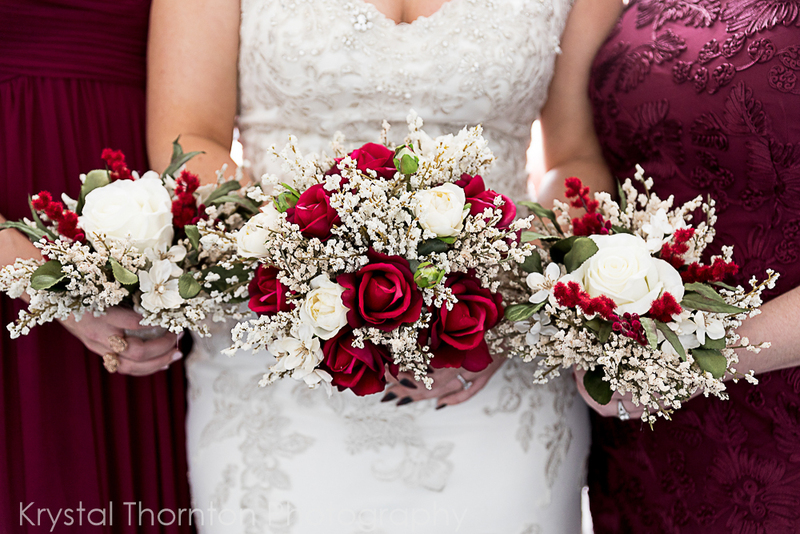 Krystal Thornton Photography strives to achieve above and beyond customer service. It’s not your job to worry about the logistics of your day. You have planned it and successfully hired professionals that understand your vision. Your professional is who you lean on during your wedding. You and your fiance’ sit back and have so much fun and allow us to navigate the day for you. When looking for pricing you have to look at the amount you are paying. Are you paying someone enough to fix a problem should it arise? Are you paying them enough to be able to go above and beyond? If you are paying a photographer enough to break even they will NOT have the means or the resources to able to deliver the customer service you deserve. At KTP you ALWAYS talk to a person. We are booking 2019 and 2020 Brides and Grooms right now. I would love to chat on the phone with you and answer any questions, or just help you with any questions or concerns you may have. You only do this once, make sure you rely on the people with your best interest at heart! And this is an amazing time for YOU because right now KTP has a SUPER CRAZY DEAL. Collections start at 2999 and go up from there! I have a question, and here’s the NO BS! I truly believe that Krystal Thornton Photography is right for you, and I would love to work with you. I think that when it comes to choosing the right photographer for your wedding day, you should choose someone with experience, knowledge understanding and your best interest at heart. This entry was posted in Family Photography and tagged Best Man, Bride, Buffalo New York wedding photographer, Chautauqua Institution, Erie Wedding Photogrpaher, Family, Family Photography, Father of the bride, Father of the groom, Groom, Jamestown New York, Jamestown photographer, Jamestown Wedding Photographer, Maid of Honor, Mother of the bride, Mother of the groom, New York Photographer, Pennsylvania Photographer, Pennsylvania Wedding Photographer, photographer, photographer near me, Wedding on December 2, 2018 by Krystal Thornton Photography. WOW! The nicest day we have had this year to get the season started and Aaron + Jess were able to celebrate on that very day. The best part is they were married in their backyard, and their reception was right next door. Friends and family gathered, traveling as far as California to celebrate the union of Aaron and Jessica. We started off at Blush Salon in the Raddison, where Jess had her hair done. It was one of the most unique and amazing hair designs I have ever seen. There were braids that went on for days, and was so gorgeous! Jess’s make up was done at Blush Salon as well and was absolutely flawless. In fact, Jess’s reaction to her make up was so awesome! She loved her hair and makeup. Aaron was so excited before Jess showed up and couldn’t wait to see her. We decided at the last minute to do the first look to catch his reaction. We all knew it was going to be great! Aaron and Jess met on a dating site. For their first date, Jess was waiting for him when one of the waitresses walked past her and spilled marinara sauce down her back. And it didn’t faze Aaron at all. After they had been together for a while, Aaron proposed to Jess on a bridge in Chicago. When Aaron and Jess’s eyes meet across a room, you can see the connection they share. It’s patient, gentle, and unconditional love. The connection they share is breathtaking. We sometimes search our whole lives looking for ‘THE’ one. And, we pray and hope we find them. And, when we do, we hold on for dear life, nurturing, caring, and working on the love that we had searched for. I have no doubt that Aaron and Jess will be able to nurture the love they have grown over these few short years together. This love they share will only grow and cultivate more love. Aaron and Jess, you two are so very loved, I wish you all the love, joy and happiness this world has to offer. Thank you for letting me be the one to capture your beautiful day! This entry was posted in Family Photography on April 21, 2018 by Krystal Thornton Photography. Alexander and Brooklynn were absolutely amazing. I don’t know that I know anyone that would have been able to handle some of the ups and downs of their wedding day as well as Alexander and Brooklynn handled their day. Due to illness and weather, important people were not able to make it. The ceremony started 20 minutes late and the weather was super nasty. But when I asked Brooklynn, “are you nervous at all?” Her response was, “No, I am so EXCITED! I am not nervous at all, I am just so excited!” And at that moment I knew Brooklynn and Alexander were made for each other. It is not usually a common response from anyone on a wedding day. They both handled the ups and downs of their day with such grace and dignity. I have never met two people so patient, kind, gentle and so unbelievably thoughtful. These two gravitate towards each other and have this connection that you can see even when they are in different ends of the room. Marriage can be tough, especially when you do not have a support system to turn to when you have questions. What I saw, was a rock-solid support system that Brooklynn and Alexander can turn to in need. Their family is so supportive, loving, gentle and kind. It’s no wonder Alexander and Brooklynn are the same way. Editing these photos was really hard, the emotion and love that surrounds this family is expressed in every photo of them. Alexander looks at Brooklynn like she’s the only one in the room, he truly sees her for who she is, his partner, his friend, his companion and most of all the love of his life. The wedding reception was held at Northbank U of M Flint, in Flint, Michigan. The ceremony was held at St. Michael’s Catholic Church. I don’t even know where, to begin with, this wedding party. They were rock stars, Brooklynn and Alexander had friends and family step up to be part of the wedding party last minute, travel over an hour to get their outfits, and to stand with them on one of the most important days of their lives. It was such an honor to be a part of such an amazingly graceful group of friends and family. I really have to give a shoutout to the parents of Brooklynn and Alexander, the love that you showered these two with was absolutely beautiful! I am so blessed to have met such awesome parents and family, you guys are so amazing! And these are the type of people I photographed. Absolutely the most thoughtful, wonderful family. Brooklynn when my daughter grows up, I hope she’s just like you! Much love to the newlyweds, I wish you all of the love and joy this world has to offer! This entry was posted in Family Photography, Kids, Wedding Party Photos, Wedding Photography and tagged Falconer wedding photographer, Jamestown New York, Jamestown photographer, Jamestown Wedding Photographer, New York Photographer, Wedding photographer, wedding photography near me, wedding pics on April 18, 2018 by Krystal Thornton Photography. This is a personal post about my wedding ring. And out of respect for my husband, he has read this post and has approved it. On January 25, 2008, my husband and I went out to a fancy dinner at “Bella Notte Ristorante” in Jackson, Michigan. We were in the balcony seating, by ourselves. We loved it up there because they had the walls decorated like it was a terrace in Italy. It’s so pretty and honestly who doesn’t love Italian food! Nate and I had been talking and it’s so funny because I remember exactly how he proposed ten years ago and two kids less LOL. We had been talking about our lives together, holding hands across the table when I said something along the lines of “Man, it feels like we’ve been together for forever, and it hasn’t even been a year.” At that moment Nate got down on one knee and said, “Speaking for forever.” He pulled out the engagement ring and asked me to marry him! Now, my husband isn’t hasty in deciding anything. He spent months and went to about 15 different jewelry stores to pick this ring out. I know you are thinking, “How dare Krystal write about how she doesn’t like her ring in a blog post.” But, I have discussed this blog with my husband and he has read it to make sure that he is okay with what I type. And, there is a very good reason for my discussing this topic. It took me four years to go to my husband and tell him how I really felt about the ring. I love my husband, I mean L-O-V-E my husband with every ounce of my being. And I never want to hurt him, and I know as gently as I put it. I did, hurt him. Fast forward 9 years, and 303 days. In December 2017 when I woke up one morning, I looked at my engagement ring. And one of the smaller diamonds was gone. My heart was completely broken. I cried. A lot. Here was this item, that I had worn on my finger for almost 10 years. Every single day. And part of it was missing. Part of me was missing. We had discussed upgrading my ring after so many years, and I thought I wanted to take the diamonds out of the ring and just rearrange the diamonds and add a heart diamond. But that moment when I had lost a diamond, I realized the importance of this ring. It’s not the ring, the metal, the jewels, the color, the shape, it’s not about any of that. And here I had spent so many years disliking this thing on my finger because of the way it looked. But here’s the cold hard truth. This ring has experienced everything I experienced from day one with my husband. Births, deaths, fights, constructions, illnesses, doctor visits, career change, moves, business start-up and so many other moments that have fleeted by without any trace. But they did leave a trace. On my heart. And I wear my heart on my left, Ring, Finger! So, it took ten years for me to realize that I had been quite blind when I received my engagement ring. And it’s ok. Because that’s what life is all about, is finding what means the most to you and keeping that around you for as long as possible. Now, Medawars of Portage, Michigan took very good care of me. Since my husband had purchased the ring from them. And even though it has been damn near ten years since the purchase. They fixed the missing diamond, polished, buffed and added Rhodium to the ring to make it stay white gold. The best part is they did it all for FREE! Thank you Medawars, when I am ready to upgrade I will be going back to you! Nate and I will be upgrading my ring in the next couple of years. We have decided to keep this ring, that I wear now the way it was when I received it, and to pass on to our kids. Thank you so much for taking the time to read this blog! If you have any questions please contact me anytime! This entry was posted in Engagement, Motivational Monday, Photography Info, Wedding Photography and tagged Bridal Party Photos, bride and groom photos, bride and groom pictures, ceremony photos, classy wedding, country wedding, destination photographer, Elopement, Engagement ring, flower girl photos, Happily Ever after, Kalamazoo wedding, Krystal Thornton Photography, large wedding, modern wedding, photographer reviews, Popular wedding photographer, pricey wedding, reception photos, Ring Shopping, Small wedding, upscale wedding, Wedding, Wedding photographer, wedding photographer prices, Wedding Photography, Wedding Photos, wedding pics, wedding pictures, Wedding ring, www.kthornphoto.com on February 5, 2018 by Krystal Thornton Photography. My first wedding for 2018 could not have been any better! I first met these two lovebirds when I photographed their engagement session. I was a huge fan of these two right from the start! The wedding day forecast anticipated rain, which changed for the better the day of the ceremony. On January 27, 2018, the weather was perfect. For a January wedding day, we had sun, and quite a bit of warmth coming in at a WHOPPING 47 degrees for a winter day. WOO HOO! Chelsea and Jimmy met at the job they both currently work at. One of the first things I noticed about Chelsea and Jimmy is that whenever they are within a close proximity of each other Jimmy will grab Chelsea’s hand to hold it whenever he can. He looks at Chelsea like she’s the only person in the world, no one else, no worries, just calm, pure, love. Chelsea got ready at their home in Gobles, Michigan. Jimmy has gone through each room and has remodeled the entire house with his bare hands and Chelsea by his side. He did his best to make sure the basement was done in time for the girls to get ready there. Creating a bar, and adding a palette design to each pole in the basement. The rustic feel fits perfectly with Chelsea and Jimmy. They are definitely country at heart. The style for the wedding fit these two perfectly with cowboy boots for the girls and just a vest for the guys. The ceremony was held in Gobles, Michigan at the Gobles United Methodist Church, that Jimmy’s family attends. The officiant for their ceremony was Paster John Brooks and Jimmy’s brother. During the ceremony, they braided rope connected to a cross made by Jimmy with palettes from their yard. The Grimes have 3 pups Maddi, Ellie, and Sadie. Ellie was supposed to be the ring bearer and they decided to keep her home so she wasn’t locked away from anyone during the ceremony. After the ceremony, we scooted back to their home to photograph the newlyweds with their wedding party and their pups. We also went and re-created their engagement photo holding the Jack Daniels bottle. After we were able to capture the photographs they wanted we headed to the reception hall which was located at Old Mill in Plainwell, Michigan. There were meatballs, chips, and salsa for an appetizer and a BURGER BAR for the dinner, and dessert was donuts from Sweetwaters. The toasts were performed by Chelsea’s dad Ed, Best Man and Maid of Honor. Chelsea gave a speech right before she danced with her dad that was quite emotional. Chelsea’s dad had to have a major heart surgery in September, all while planning her wedding. And I can understand how emotional, and stressful this can be during what is supposed to be the happiest time in your life. Thankfully, Dad (Ed) pulled through quickly and is doing great! I wish these two all the happiness this world has to offer. Congratulations Chelsea and Jimmy Grimes! This entry was posted in Family Photography, Wedding Party Photos, Wedding Photography and tagged Bride, Groom, Kalamazoo, Kalamazoo Wedding photographer, Michigan, Old Mill, Photographer near, Plainwell, Wedding, Wedding photographer, Wedding Photography on February 2, 2018 by Krystal Thornton Photography.